Hello, friends and families of Riverfront Theatre Company – Windsor’s Premiere Youth Theatre Company! Our first production, Fee, Fi, Fo, Fum, will be hitting the stage in less than two weeks! 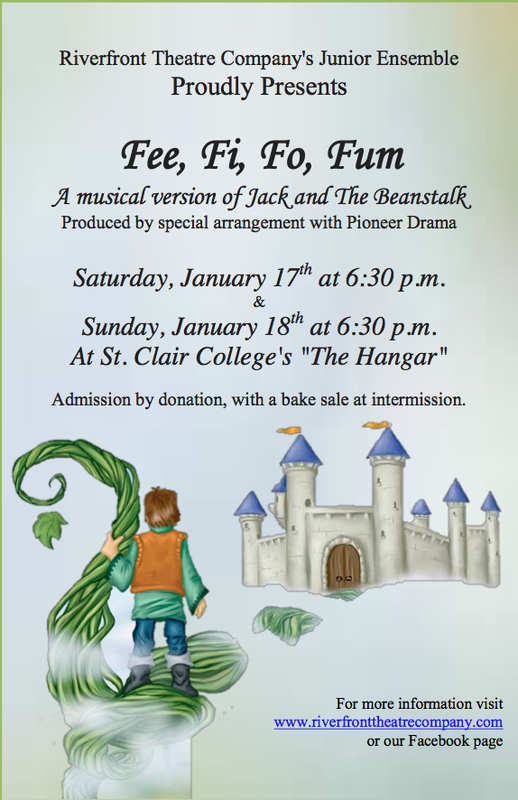 Our Junior cast will be presenting this charming musical based on the story of Jack and the Beanstalk, at the “Hangar” stage at St. Clair College. Our Juniors are a lively group of 15 students between the ages of five and ten. Many of them will be on stage for the very first time this year! This event is suitable for families of all ages. We don’t sell tickets to our Junior events – instead, we take a donation at the door, and for our bake sale, held at intermission. Donations raised from the proceeds of this performance will go towards the cost of this and other RTC 2014-2015 productions. We thank you for your support! Next: Next post: Outrageous Fortune: February 13-15, 2015 at The Olde Walkerville Theatre!